1. 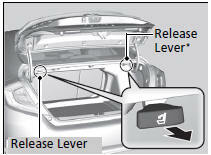 Pull the release lever in the trunk to release the lock. 2. Fold the seat-back down. The rear seat-back(s*) can be folded down to accommodate bulkier items in the trunk. Never drive with the seat-back folded down and the trunk lid open. To lock a seat-back upright, push it backwards until it locks. When returning the seat-back to its original position, push it firmly back. Also, make sure all rear shoulder belts are positioned in front of the seat-back. Make sure that the folded seat-back does not press against the front passenger seat, as this can cause the weight sensors in the front passenger seat to work improperly. 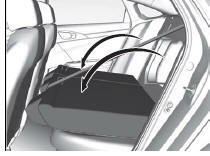 Make sure all items in the trunk or items extending through the opening into the rear seats are properly secured. Loose items can fly forward if you have to brake hard. The front seat(s) must be far enough forward so they do not interfere with the rear seats as they fold down.